The weather forecast looks a little iffy this weekend, with lots of clouds and maybe even a flurry or two on Saturday (! ), but that doesn't mean you have to sit inside and Netflix-and-chill your time away. 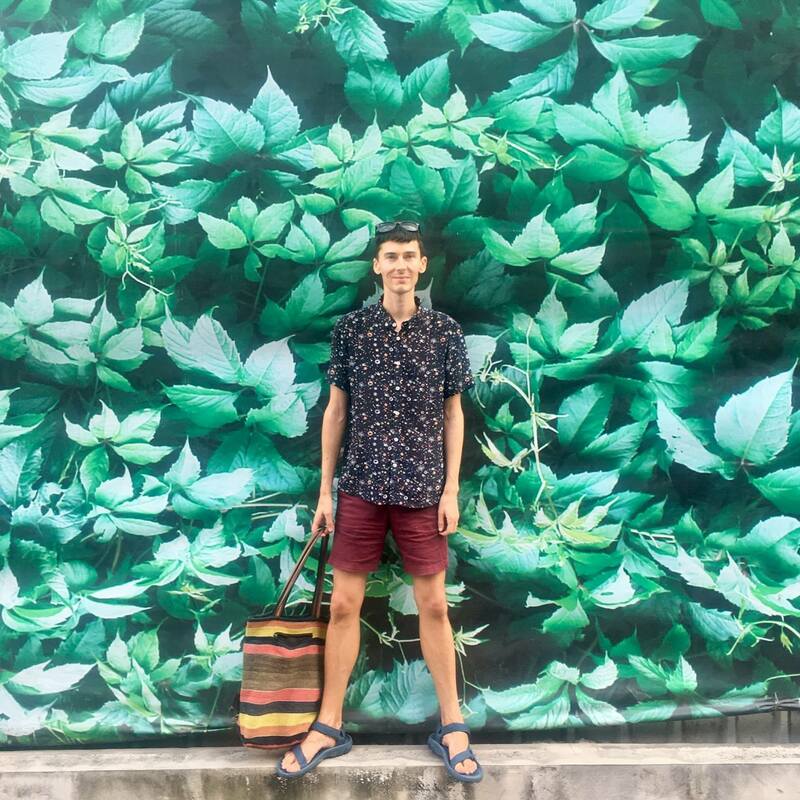 There are tons of things happening in the city this weekend, namely a whole lineup of cool First Friday art openings in Old City (we lay out four exhibits to check out below). It’s also the kickoff of the Subaru Cherry Blossom Festival, which brings a whole week’s worth of activities to venues around the city to celebrate the gorgeous cherry blossom trees we’ve been seeing all over our Instagram feeds. On top of that, GayBINGO! returns for its last hurrah of the season with a disco theme, the Philadelphia Environmental Film Festival rolls along and Jerry Seinfeld performs at the Academy of Music. Find details on all that and more below. 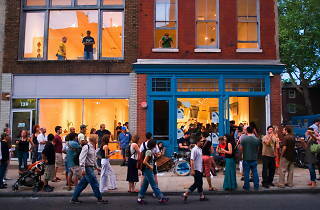 Hopefully the rain stays away long enough to allow folks the chance to enjoy First Friday in Old City this weekend. 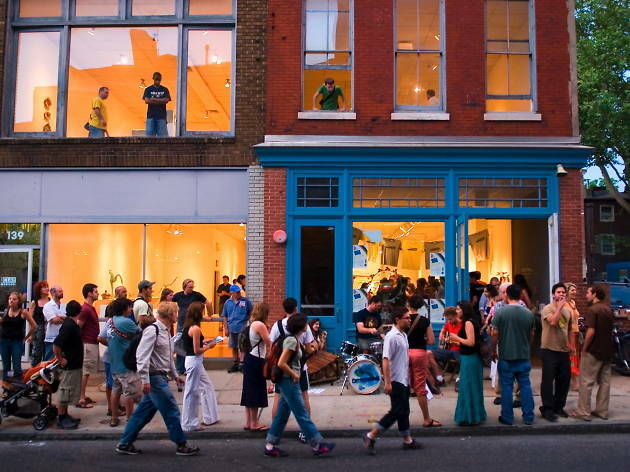 If you don’t know the drill: From 5 to 9pm on the first Friday of each month, Philadelphian art lovers take to the streets of Old City to browse over 40 galleries, which all stay open late to debut their latest exhibitions. Cafés and restaurants also get in on the fun, serving up food and drinks, and neighborhood boutiques put on sales for those looking to do some late-night shopping. The streets come alive with the sounds of live music, and local artisans set up makeshift booths to sell wares on the sidewalks. We’ve laid out a couple cool exhibits to check out below. Old City outdoor gear retailer United By Blue teams up with True Hand Society and Oxford Pennant to create a limited collection of of Philly-inspired pennants and banners that you can hang on your wall to rep your 215 pride. The pennants shout out Philly neighborhoods, such as Fishtown and Olde City, and other slogans tied to our history, like Ben Franklin’s Revolutionary War-era cartoon “Join or Die.” The works will be available while supplies last through the month of April in both UBB locations. This second annual film fest features 35 environmental films—both shorts and feature-length works–that spotlight some of the challenges our planet is facing and the groups working to make it right. Perhaps they’ll inspire you to get even more green-friendly. The first week of this annual festival kicks off with an itinerary of parties, food events and theater to celebrate not only Japan’s traditions but also the jaw-dropping cherry blossom trees in Fairmount Park. Timed around when the trees are expected to be at full bloom, the hoopla is anchored by two major events that actually happen next weekend, so mark your calendar: the Cherry Blossom 10K on April 14, which takes runners on a scenic loop through Fairmount Park, and Sunday Sakura, a daylong bash on April 15 that features traditional drum circles, live music, dancing, fashion shows and karaoke. Here’s your chance to play BINGO with a wild gaggle of drag queens before they pack up their cards and chips for the season. The final spring 2018 GayBINGO! night is Studio 54-themed, so channel your inner Andy and Liza, throw on some bell bottoms check off your numbers like a disco queen. The night is always a blast, cash prizes are up for grabs and—whether you win or lose—you’ll always walk out knowing you backed a good cause: Proceeds benefit local HIV/AIDS-fighting nonprofit AIDS Fund. The wildly popular ’90s sitcom star brings jokes to the Avenue of the Arts. As of press time, there are still tickets available for the 9pm Seinfeld show.